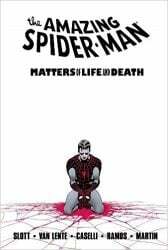 As I was saying, Dan Slott started to work on the Amazing Spider-Man prior to the official beginning of his run as the main writer on the series. But Big Time is where to start. Big Time it’s more than 50 issues in two years. Big Time – Collects Amazing Spider-Man issues #648–651. Spider Island – Collects Amazing Spider-Man issues #666–673, Venom #6–9, Spider – Island: Deadly Foes, material from Amazing Spider – Man #659–660, #662–665, Spider-Island Spotlight. This is where Avenging Spider-Man is introduced. Flying Blind – Collects Amazing Spider-Man issues #674–677, and the crossover to Daredevil #8. Ends of the Earth – Collects Amazing Spider-Man issues #682–687, Ends of the Earth #1 and Avenging Spider-Man #8. Lizard: No Turning Back – Collects Amazing Spider-Man issues #688–691 and Untold Tales of Spider-Man #9. Danger Zone – Collects Amazing Spider-Man issues #692–697, and Avenging Spider-Man #11. Big Time: The Complete Collection Volume 1 – Collects Amazing Spider-Man #648, #649–662, #654.1. 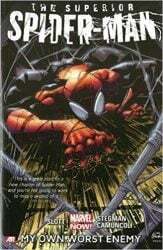 Big Time: The Complete Collection Volume 2 – Collects Amazing Spider-Man #663–677, Amazing Spider-Man Infested #1, Free Comic Book Day 2011, Spider-Island: Deadly Foes #1, Daredevil #8, Spider-Island Spotlight. Big Time: The Complete Collection Volume 3 – Collects Amazing Spider-Man #677–687, #679.1; Amazing Spider-Man: Ends of the Earth #1; Avenging Spider-Man #8. Big Time: The Complete Collection Volume 4 – Collects Amazing Spider-Man #688–697, Avenging Spider-Man #11, Alpha: Big Time #1–5. Spider-Man isn’t Amazing anymore, he is Superior. Also, Avenging Spider-Man is replaced by Superior Spider-Man Team-Up. My Own Worst Enemy – Collects Superior Spider-Man issues #1–5, Annual 1 & AvSM #20–22, and Daredevil #22. We are now back to the Amazing Spider-Man, a good entry point. If you want to start somewhere, but not too early. Peter Parker is himself again, in full control and ready to go big. The Parker Luck – Collects Amazing Spider-Man (2014) #1–6. Learning to Crawl – Collects Amazing Spider-Man Volume #1.1-1.5: It’s a quite optional flashback story. Edge of the Spider-Verse – see the Spider-verse reading order. Spider-Verse – see the Spider-verse reading order. Graveyard Shift – Collects Amazing Spider-Man (2014) #16–18 & Annual. Spiral – Collects Amazing Spider-Man (2014) #16.1-20.1. After the Spider-verse Event, it’s a new and quite original beginning for Peter Parker with Parker Industries going global. Also, another entry point. Worldwide, Vol. 1 – Collects Amazing Spider-Man (2016) #1–5. Worldwide, Vol. 2 – Collects Amazing Spider-Man (2016) #6–11. Worldwide, Vol. 3 – Collects Amazing Spider-Man (2016) #12–15. Worldwide, Vol. 4 – Collects Amazing Spider-Man (2016) #16–18 & Annual 1. The Clone Conspiracy – see the Clone Conspiracy reading order. Worldwide, Vol. 5 – Collects Amazing Spider-Man (2016) #19–24. Skip it if you have The Clone Conspiracy book. Worldwide Vol. 6 – Collects Amazing Spider-Man (2016) #25–28. After the event of the Secret Empire crossover, Pete’s life is not the same, it’s kind of a new beginning again. Also, it’s the last arc written by Dan Slott. Worldwide, Vol. 7 – Collects Amazing Spider-Man (2016) #29-32, #789-791. Amazing Spider-Man: Venom Inc. – Collects Amazing Spider-Man: Venom Inc. Alpha 1, Amazing Spider-Man (2016) #792-793, Venom #159-160, Amazing Spider-Man: Venom Inc. Omega 1. Worldwide Vol. 8 – Collects Amazing Spider-Man (2016) #794-796. Worldwide Vol. 9 – Collects Amazing Spider-Man (2016) #797-801. Hello! 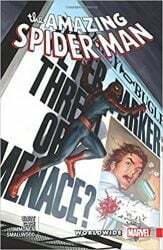 I’ve only ever read Ultimate Spiderman recently and ever since I finished it, I’ve been looking for more spidey and decided to head into The Amazing Spiderman. Does this list require anything prior to “Big Time”? Will I be able to understand everything if I start from there? And if not, can you give me some advice that wouldn’t require I read from the 1963 version cause I tried and could not get into it. Okay thank you! I’ll start reading from there and use this post a guide, keep up the good work!